Manchester United are reportedly expecting to have to pay around £100million to seal the transfer of a big-name forward to replace Anthony Martial. The Red Devils are determined to tie the France international down to a new contract to avoid having to splash out in the transfer market for what would likely be a hugely costly venture. 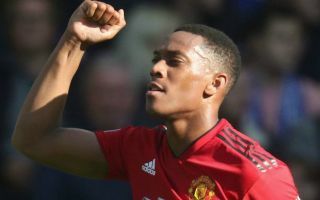 Martial has improved a huge amount this season and seems to have finally won over manager Jose Mourinho, though the club are yet to tie him down to a new deal. According to the Metro, United hope to do so soon as they fear they’ll otherwise have to recruit another expensive big name up front to make up for his departure. No names are mentioned in the report, though one can imagine the kinds of players who might be on MUFC’s radar based on recent transfer speculation involving the club. One of the finest forward players in the world for the last few years and an outsider for this year’s Ballon d’Or, Antoine Griezmann was strongly linked with United last season and the year before. The Frenchman is an ideal replacement for Martial, arguably carrying more of a goal threat, and generally performing more consistently at the highest level for some time now. Another La Liga-based talent, Gareth Bale has also been linked with United repeatedly for the last few years, though he’s still at the Bernabeu and the chance of him moving to Old Trafford perhaps decreases with every passing year. It remains to be seen if United would still prioritise the 29-year-old as target after his recent dip in form, but he remains a big enough name that he’d probably still cost £100m or so to prise away from Madrid. Bale’s Real team-mate Marco Asensio could be another fine option for the Red Devils, and has the benefit of being a bit younger. The Spaniard isn’t always a regular starter for Los Blancos so is perhaps a slightly riskier signing from that point of view, though he does look to have the potential to improve tremendously in the right team. Another outstanding young talent, Ousmane Dembele is struggling to really fulfil his potential at Barcelona, and there’s been talk he could move on soon. United are among those to be mentioned as suitors for the 21-year-old, though perhaps not as strongly as clubs like Liverpool, Arsenal and Paris Saint-Germain. Who would you spend £100m on if it did come to having to replace Martial? Who'd be your ideal Martial replacement?